A new school year often prompts reflection on how much one’s children have grown over the past year. Whether your kids are back to school this fall or still in diapers, we know their safety is your top priority. To help make your job easier, we’ve designed a number of retail safety products that grow with your children through the years, from infancy to childhood. 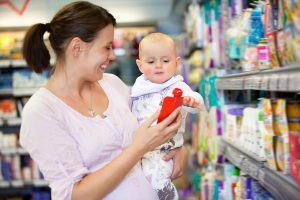 Keep reading to learn more about how Safe-Strap’s products can keep your child safe at the store during each exciting stage of his or her life. Despite the warnings, many parents continue to balance infant seats on shopping carts. As a result, hundreds of preventable accidents occur to infants in retail stores each year. Parents have a few options to make shopping safer for their infants, including baby wearing and placing their infant carrier inside the cart’s basket. However, neither of these options is ideal for all parents. That’s why we invented Safe-Dock, the first universal car seat docking station for shopping carts. It’s designed to securely hold most infant carriers sold in the United States, so you can easily transition your carrier from the car to the cart before searching for your groceries. It doesn’t get much simpler than that! Once your baby is able to sit up without support, he or she is ready to ride in the shopping cart’s seat. We have you covered there, too, with our shopping cart seat belts, which are built to withstand the day-to-day rigors of the shopping environment. The seat belt will keep your child secured in the cart, so you can take your time walking the aisles. As your child grows – or if you have more than one child to keep an eye on at the grocery store – we encourage you to use our Shop-Along. It offers a comfortable and secure seating area that can accommodate two children or one adult, along with a large storage area under the seat for bulk merchandise purchases like paper products or soft drinks. Shop-Along affords children an enjoyable and safe ride through the store, while you enjoy the benefits of secure kids and adequate space for all of your purchases. Here at Safe-Strap, we’re committed to supporting your children through all their ages and stages. We hope you’ll make use of one of our products the next time you visit the store to simplify your shopping experience.